Haiti is a Caribbean country that shares the island of Hispaniola with the Dominican Republic to its east. The region was originally inhabited by the indigenous Taino people. Spain landed on the island on 5 December 1492 during the first voyage of Christopher Columbus across the Atlantic. When Columbus initially landed in Haiti, he had thought he had found India or China. The island was named La Espanola and claimed by Spain, which ruled until the early 17th century. Haiti has a rich and unique cultural identity, consisting of a melange of traditional customs of French and African, mixed with those from the Spanish and indigenous Taino cultures. 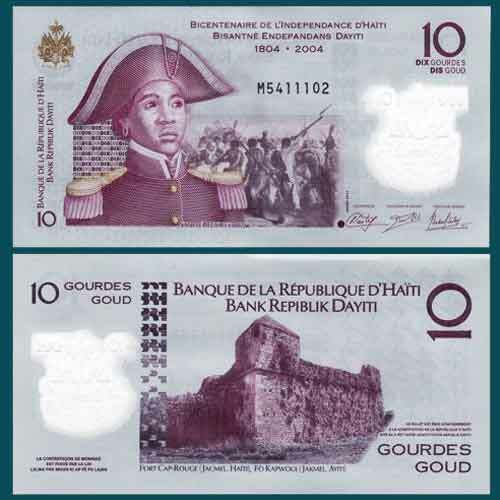 Haiti's culture is greatly reflected in its paintings, music, literature and obviously through their currency! Obverse: This blue-green note depicts a woman military leader, Lieutenant Mme Suzanne Sanite Belair (1781 - 1802) to left with a Battle scene in the centre background. Watermark window to right with the Coat of Arms of Haiti (canons, flags, drum, anchor, soufflets, trumpet, sailing ship, palm tree with Phrygian cap) in the left corner. The denominational value in words and numbers in right top and left bottom corners with the bank name and serial number at centre top. Three signatures of Governor, Deputy Governor and Director General are seen in the right bottom corner. Reverse: Fort Cap-Rouge in Jacmel, Haiti is seen in the centre. Predominant colours of the note are light blue-grey and purple. Watermark window to right with denominational value in words in right bottom corner and numbers in right top corner and together in the left top corner with the bank name at centre top.